SubTerra, Inc. has worked on numerous tunnel, microtunnel, horizontal directional drilling and underground projects throughout the United States and Canada, including, most recently, the Metro Goldline East project in Los Angeles (twin 20-ft diameter subway tunnels); the Lincoln Automobile and Pedestrian Tunnel (35-ft wide by 14.5-ft high) in Bellevue, WA; the Panama Wastewater Tunnels (11 to 13-ft diameter tunnels, 40,000-ft in total length); and the Brightwater Project in Seattle, WA (wastewater tunnels between 10-ft and 20-ft in diameter and 18,000-ft long). Other recent projects, where Trenchless Designs were used are summarized in the following table. *Note: Project Methods include both Engineer designed/specified and Contractor opted or executed. 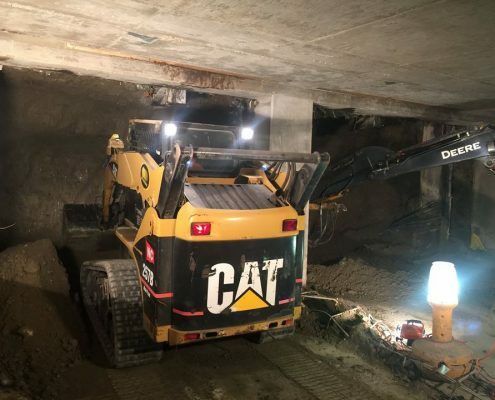 This part of a trenchless project typically dovetails and follows on from the scoping meeting where available data and information are typically presented and discussed along with project plans that have led to the need for trenchless technology. Introduction: Description of preliminary concepts and scope of work. Design Basis and Functional Criteria. Ground Support Components and Design. Permitting, easement, and other planning needs and requirements. Preliminary Cost and Schedule Estimate. We have found that this approach and documentation ensures that all participants are “on the same page and heading in the right direction”. The approach also ensures clear scoping for the Geotechnical Engineering contractor who will be responsible for collecting this important project data. Final design would commence once all elements of the project are at a sufficient stage of completion such that there is minimal probability that they will change. The final design of each trenchless construction element would follow on from the preliminary designs previously discussed. Typically, final designs are refinements to the preliminary work product. Permits and Right of Way. Risk Management Analysis: One of the final activities in Final Design is the preparation of a Project Risk Analysis. This analysis lists potential areas of risk (risk register); segregates risks by category (e.g., Design Related Risks, Procurement Risks, Schedule Related Risks, Geotechnical Risks, and Other Risks; assigns responsibility for each risk area (e.g., Owner, Contractor); describes how each risk has been recognized and assigned (e.g., by contract or specification), and develops a risk monitoring and mitigation program. The SubTerra team typically assists owners in contacting prospective bidders and advertising the Trenchless Project in regional and national publications, depending on project size. SubTerra’s Team will provide support in conducting pre-bid conferences and has done so on many previous occasions. SubTerra, Inc. pioneered the use of 3-D “design visualizations” for describing technically difficult tunnel projects in Austin. These 3-D shaft and tunnel animations have been used to illustrate the project components to interested bidders. The SubTerra team is typically fully involved in the construction phase to facilitate efficient construction. We typically conduct site visits to review progress and quality; review and recommend approval/disapproval of pay estimates; review and approve submittals; respond to requests for information (RFIs) and any necessary change orders; interpret plans, specifications, and other contract documents; prepare as-built drawings; and certify that the project was constructed in accordance with approved plans and specifications.